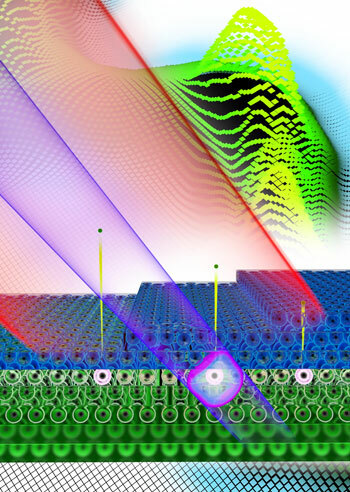 (Nanowerk News) An international team of researchers from the Technische Universität München and the Max Planck Institute of Quantum Optics in Garching has measured how fast an electron races through the atomic layers of a crystal lattice ("Direct observation of electron propagation and dielectric screening on the atomic length scale"). The physicists used an extremely short laser pulse to time the speed: According to their measurements, the electron needs 40 attoseconds to pass through one layer of magnesium atoms. One attosecond is a billionth of a billionth of a second. The accurate knowledge of how electrons move through a material could assist researchers in the development of smaller and faster electronic components. The time dimensions in which electrons move within atoms are almost unimaginably short. If they are excited by light, for example, they change their quantum mechanical “location” in time spans of mere attoseconds. An international team of researchers headed by Reinhard Kienberger, Professor for Laser and X-Ray Physics at the Technische Universität München and Max Planck Fellow at the Max Planck Institute of Quantum Optics, has now determined how long an electron takes to pass through a single atomic layer. The researchers found that an electron from a tungsten crystal races through a layer of magnesium atoms which is only a few billionths of a metre thick in 40 attoseconds. The physicists applied a defined number of layers of magnesium atoms to a tungsten crystal for their experiment, which also involved scientists from Ludwig-Maximilians-Universität München and Vienna University of Technology. They sent two light pulses onto these samples. The first light pulse lasted around 450 attoseconds at frequencies in the extreme ultraviolet. This flash of light penetrated into the material and released one electron from very close to the atomic nucleus from both the magnesium layers as well as the tungsten crystal below them. On being released, the “tungsten electron” and the “magnesium electron” moved through the crystal right through to its surface, from where they left the solid body. (Electrons from the tungsten crystal could penetrate through four layers of magnesium atoms at most.) The particles here were affected by the electric field of the second laser pulse, an infrared wave with a duration of less than five femtoseconds. As the “tungsten electron” and the “magnesium electron” also arrived at the surface at different times owing to the different lengths of their journeys, they experienced the second, infrared light pulse at different times, i.e. they experienced different strengths of the oscillating electric field. Accordingly, the two particles were accelerated by different degrees as well. From the resulting energy differences of the electrons, the researchers were able to determine how long an electron needs to pass through one layer of atoms. The experiments provide information on how electrons move in the microcosm. The knowledge of how fast an electron moves from one location to another is also important for applications: “While a great many electrons move over distances which are still large in today’s transistors, for example, individual electrons could transmit a signal via nanostructures in the future,” says Reinhard Kienberger. “This means that electronic devices, such as computers, could become several times faster and smaller.” In order to develop the necessary components, researchers want to gain a better understanding of how fast electrons travel the tiny distances in such electronic elements.